"Don't buy packaged mixes for hamburger, and subject your family to their preservatives and mediocre taste! Make your ground beef go further with this easy, quick, fun recipe that is SOOOO much better!" Place ground beef in a skillet over medium-high heat. Cook and crumble until evenly browned. Drain grease, and set aside. Meanwhile place potatoes in a saucepan with enough water to cover. bring to a boil, and cook for about 10 minutes, until just tender. Drain potatoes, and remove from the pan. Heat oil over medium heat using the pan that the potatoes were cooked in. Add the bell pepper and onion. Cook and stir for about 5 minutes, until tender. 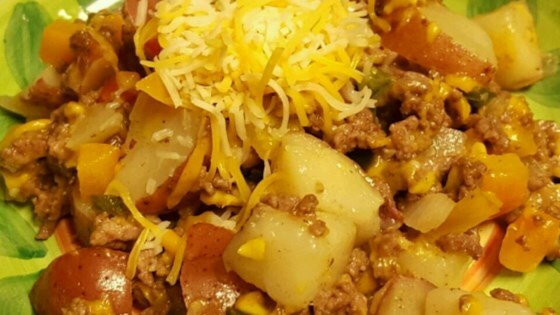 Mix in the ground beef and potatoes, cooking until heated through, about 5 minutes. Stir in cheese, and remove from heat. Serve immediately. See a quick trick for eating a juicy burger without the mess! If you try this you have to really think about how you want to spice it up. I added many seasonings to this and also ended up adding a little Velveeta for creaminess. Not bad, a good recipe to use as a base and customize for your own tastes or to use whatever is on hand. I added some taco seasoning and some corn. I cooked the onion and pepper with the ground beef and added taco seasoning. Family loved it. This was awful, nobody ate it. It was bland and needed some spice.